Beautiful Sanders throw. Knitted with high quality fabric to duplicate Sander's original design. 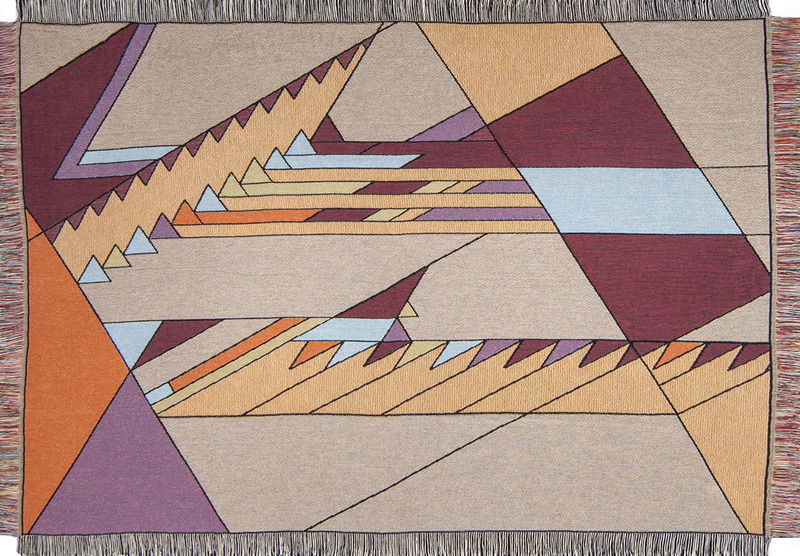 This Sanders throw blanket was designed by Frank Lloyd Wright. Size: Approx. 50" x 70" 100% Cotton Machine Washable “NATURE’S CASCADE” MURAL IN FRANK S. SANDER RESIDENCE STAMFORD, CT (1952) Fondly referred to as ‘Springbough’, the Sander Residence is integrated into the brow of a hill with an outcrop of sedimentary layers of ledge rock. Dogwood trees and wild flowers fill the surrounding woodland setting. The marriage of this colorful landscape, the cantilevered roofline of the house, and diagonal streams of sunlight cascading through rows of clerestory windows are referenced in the color and design of this throw.